One of my all-time favorites this week. Simple yet effective drill. Coaches stand on both blue lines in the center of the ice with pucks. Players stand on the blue lines and in the center circle. Players in the middle are backchecking the players on the wall. Backchecker stands facing the coach. 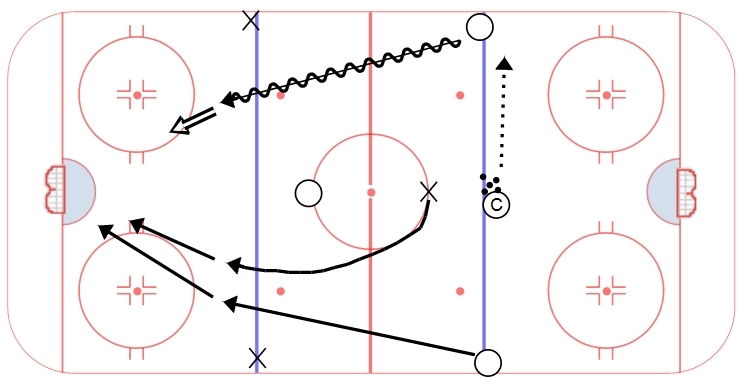 Coach will pass to one wing or the other, on the pass the backchecker turns and backchecks the player without the puck. The player with the puck drives for a long shot (top of the circles) and looking to go far pad for a rebound to the other attacker. As a variation, the coach can tell the backchecker to backcheck the puck carrier. This drill is a good conditioning workout for players and also allows for teaching effective backchecking. Gaining the inside shoulder and taking away sticks are critical pieces of the backcheck. It isn’t good enough to just follow your man back to the net – you need to isolate them from being a threat.